Authors: Krivoshlykova L.V., Chernyakova Y.S. The ways Vladimir Nabokov portrays people are analysed through the prism of the writer’s bilingualism. The research is based on the writer`s autobiographic memoirs «Conclusive Evidence / Другие берега» and his novel «Камера обскура»/ «Laughter in the Dark». 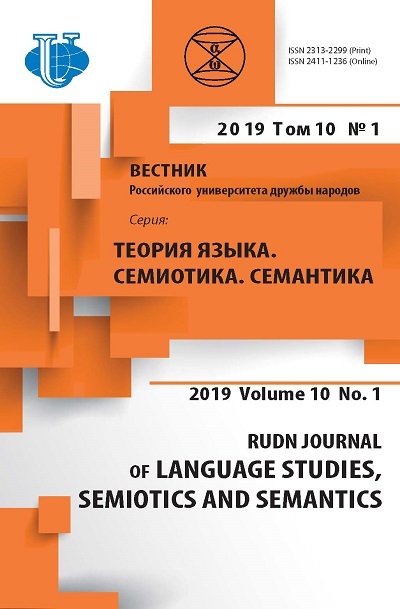 The study aims to highlight the means used to reach the adequacy and equivalence of translation by applying comparative method and method of semantic analysis. The study confirms the hypothesis that Vladimir Nabokov’s bilingualism and synesthesia are closely interconnected, shape his linguistic and cultural worldview and influence the strategies and tools he applies when translating his own texts. bilingualism, author’s translation, exact translation, culture code, linguocultural concept, allusion. Kozhin, A.N., Krylova, O.A. & аnd Odintsov, V.V. (1982). Functional Types of Speech. Moscow: Vysshaya Shkola (in Russ). Krivoshlykova, L.V. (2014). Author’s note in the free indirect discourse of the memoirs of Vladimir Nabokov. In: Functional semantics and semiotics of sign systems: a collection of scientific articles: 2 pt. / Ed. V.N. Denissenko, E.A. Krassina, N.V. Novospasskaya, N.V. Perfilieva. Moscow: RUDN. p. 446—452. (in Russ). Nabokov, V.V. (1996). The art of translation. In: Lectures on Russian Literature. Moscow: Nezavisimaya Gazeta Publishing. (in Russ). Platonova, D.O. (2012). The “Tolstoy” concept in Anglo-American linguistic culture (the derivational aspect of the extrasone). Science Journal of Volgograd State University. Linguistics, 2, 157—161. (in Russ). Platonova, D.O. (2012). Tolstoy concept in Anglo-American linguistic culture: the aspect of appraisal. Perm University Bulletin. Russian and Foreign Philology, 4, 69—74. URL: http://cyberleninka.ru/article/n/kontsept-tolstoy-v-anglo-amerikanskoy-lingvokulture-aspekt-otsenochnosti (accessed: 11.10.2016). (in Russ). Slyshkin, G.G. (2004). Linguistic Culture Concepts and Metaconcepts: [dissertation abstract]. Volgograd: Volgograd state pedagogical University. (in Russ). Sepir, E. (1993). Selected Works on Linguistics and Culturology. Moscow: Progress. (in Russ). Fedorov, A.V. (2002). Fundamentals of General theory of translation (linguistic issues): handbook. 5 th ed. St. Petersburg: Philological Faculty of St. Petersburg State University; Moscow: OOO «Izdatel'skii Dom “FILOLOGIA TRI”». (in Russ). Yakobson, R.O. (1985). On the linguistic aspects of translation. In: Selected works. Moscow. (in Russ). Morozova, S.V. Semenov, L.N. Kudryavtseva, T.V. & Yakushkina, N.V. Cultural studies. Part 1: tutorial. Moscow: Moscow State University of Printing Arts Publishing house, 2000. URL: http://hi-edu.ru/ebooks/xbook880/01/part-005.htm (accessed: 11.10.2016). (in Russ). Reminiscence, allusion, quotation // Encyclopedia K2, 2013. URL: https://www.proza.ru/ 2013/12/18/1832 (accessed: 11.10.2016). (in Russ). Nabokov’s interview. (02) BBC Television. 1962. URL: http://lib.ru/NABOKOW/Inter02.txt (accessed: 12.05.2015). Komissarov, V.N. (1990). Theory of translation (linguistic aspects). Moscow: Vysshaya Shkola. URL: http://www.classes.ru/grammar/43.Teoriya_perevoda_Lingvicticheskiye_aspekty (accessed: 16.12.2016.) (in Russ). Copyright (c) 2017 Krivoshlykova L.V., Chernyakova Y.S.